A collection of information, education, thoughts and ramblings about the Boxer breed. Puppies for sale or dog training ads which appear on the Boxers 101 blog do not necessarily represent either businesses or actions recommended by Boxers 101. 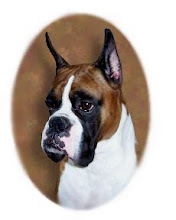 For information about Boxer breeders and training Boxers, please visit the Boxer Crazy forum. Several Iams and Eukanuba dog foods have been recalled due to a possible salmonella contamination. The foods are sold in specialty pet stores and vet clinics in the US and Canada. Owners are advised to throw away the food and contact Procter & Gamble, the parent company for Iams and Eukanuba, with questions and for a product refund. Read more in my National Boxer Examiner column. Locally, Western Michigan residents are watching the effects of an oil spill in the Kalamazoo River. Latest news is that the spill has been contained, though some are skeptical of these claims. Residents are still advised to avoid the area as much as possible, and to stop any water activities including using Kalamazoo River water for watering lawns, plants or animals. Some homeowners in Calhoun County, near the origin of the spill, are under a voluntary evacuation recommendation due to benzenes in the air. Read more in my Detroit Boxer Examiner column. A project to inform and educate others about the Boxer breed, one blog post at a time. The information provided in the Boxers 101 blog is for informational purposes only and is not meant to replace the advice of a veterinarian, trainer or behaviorist. When in doubt, seek the advice of a professional. Copyright © 2010 Boxers 101. All rights reserved. Picture Window theme. Theme images by linearcurves. Powered by Blogger.